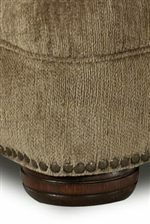 The Tolbert collection provides your home with stunning traditional style upholstery that's both incredibly elegant and satisfyingly comfortable. 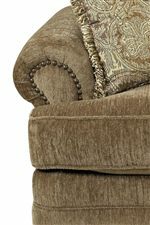 The classic chair, loveseat, and sofa from the Tolbert collection feature soft, plush frames adorned with ornate design accents like rolled arms, nailhead trim, and exposed wood bun feet. Made to last, these pieces were constructed with durable and supportive sinuous wire springs and carefully padded with high compression foam. Browse other items in the Tolbert collection from AHFA in the area.